Democracy: “what June 12 taught us” – Tinubu – Royal Times of Nigeria. All Progressives Congress (APC) chieftain, Sen. Bola Tinubu, says without the uncompromising resistance to military rule engendered by the annulment of the June 12, 1993 election, there would probably not have been a 4th Republic today. Tinubu said this in a message on Sunday night entitled ‘What June 12 Taught Us’, to mark the 24th anniversary of the annulled presidential election, believed to have been won by Chief Moshood Abiola. Abiola, who insisted on his mandate after the annulment by the then military President, Gen. Ibrahim Babangida, was later arrested and died in detention on July 7, 1998 on the verge of being released. Tinubu said: ”The annulment was a bitter pill to swallow, especially for the millions of people who expended so much time, energy and material resources to help ensure victory for Chief MKO Abiola. ”The annulment was meant to halt the unstoppable and irresistible march to deeper democratic practice in Nigeria. That objective failed woefully. ”That annulled free and fair election taught us once again to organise. It tutored us new tactics and strategies of confronting and ultimately overcoming forces of dictatorship. ”It revealed to us the imperative of forging working relationships and diverse networks across ethnic, religious, regional and partisan divides if we were to move forward. “It is this invaluable experience we gathered in the struggle to enthrone democracy and retrieve our country from the grip of dictatorship that emboldens us today to warn those directly or indirectly threatening our democracy through another military intervention to perish the idea’’. According to him, 24 years after its annulment, the spirit of June 12 lives on in the hearts and minds of millions of Nigerians. “The blood of those who gave their yesterday and sacrificed even their lives for the democracy and freedom we enjoy today was not shed in vain, ” he said. Tinubu described MKO as an embodiment of the eternal Yoruba adage which says that ‘Death is better with honour than life without dignity’. He said that late MKO selflessly committed so much of his substantial fortune toward ensuring his victory at the polls. Tinubu said that Abiola, in doing so, was not motivated by personal, selfish or pecuniary considerations. ”Abiola could have chosen to abandon the mandate in order to rebuild and resuscitate his disrupted business, but he opted for the path of the true ‘Omoluabi’. ”He refused to sacrifice honour for an ephemeral mess of pottage. Looking back, we can say, thank you Chief MKO Abiola for giving your all that we may bask in the glow of democracy today. ”The lessons of that election still speak eloquently to us today despite the utter lack of vision in governance between 1999 and 2015 that has fuelled the revival of separatist agitations and deepened distrust among the component parts of Nigeria. ”One enduring truth that June 12 demonstrated is that given inspirational, visionary and sincere leadership, Nigerians can rise above divisive primordial sentiments to demonstrate high patriotism and a belief in merit in their voting patterns, ” he said. 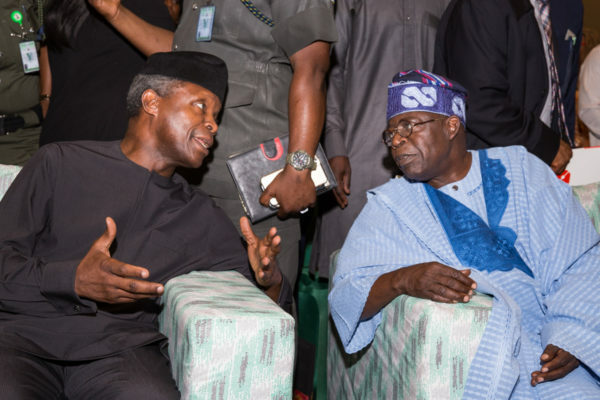 Tinubu also used the occasion to appraise two years of the President Muhammadu Buhari led-administration, saying that it had already taken impressive strides in addressing the country’s challenges. ”This year’s commemoration of the anniversary of June 12 coincides roughly with two years in office of the All Progressives Congress at the federal level. ”Some critics, particularly of the opposition, are already writing off the government as a failure. Well, that is their prerogative and in accordance with their rights in a democratic polity. ”Two years into its term, any objective analyst will agree that the APC has already taken impressive strides to clear the Augean stables it inherited from the past administration. ”Concrete gains are being made in curtailing corruption, reviving and diversifying the economy and strengthening national security, even though much harder work still lie ahead admittedly,’’ he said. According to him, there is no doubt that once the APC Federal Government successfully contains these challenges, it can more urgently begin to address other planks of its manifesto. ”But even in our darkest moments, let the torch of democracy be our guide to the higher and nobler plains of good governance, strong institutions, reverence for the rule of law and a continually-improving and growing economy. ”It is only through strengthening the institutions, practices and procedures of democracy that we, like the Americans, foremost exemplars of the democratic ideal, can ceaselessly strive moment by moment, day by day and year by year to continually aspire toward the more perfect union of our dreams, ” Tinubu said.